Behavioral scientists, educators, and organizational leaders are all likely to benefit from this theoretical and practical text. Since the uses of an inspiration lab could be quite varied, the book includes several case studies that demonstrate how the inspiration lab environment applies to very specific areas, such as social development programs or healthcare services. The bulk of the book addresses the ways in which inspiration engineering can be useful. For example, one chapter discusses its applicability to problem solving, while another chapter describes inspiration engineering as it applies to building an entrepreneurial culture. The authors also talk about creating an “inspiration currency,” which refers not to money but rather to other valuable characteristics such as technical expertise or organizational knowledge. Again, specific case studies help make the abstract idea of inspiration currency more understandable. The end of the book concentrates on applying inspiration engineering on a broader scale—for example, the authors show how to develop an “inspiring business model” and examine how inspiration labs can be used in governments. An extensive bibliography is included, along with appendices that provide further detailed information and real-world applications. It should be pointed out that some of the material is challenging to understand. While this is due in part to the conceptual nature of inspiration engineering itself, the complexity of the subject matter and the formal use of language contribute to the level of comprehension difficulty. Grammatical errors hamper the book’s readability. On the positive side, numerous graphic charts help to explain the text, and the multiple case studies go a long way to demonstrate how inspiration engineering and inspiration labs can be put into practice. From both a theoretical and a practical perspective, this book demonstrates very clearly that Buheji and Ahmed are expert authorities on the topic of inspiration engineering. 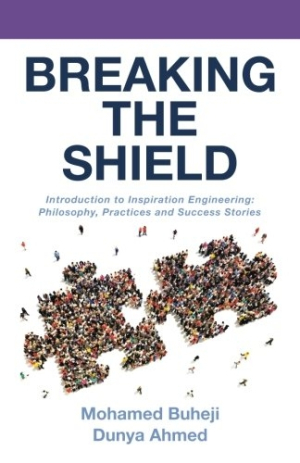 Behavioral scientists, educators, and organizational leaders are all likely to benefit from Breaking the Shield.